Dynamic Aqua Science is a global cooperation that manufacturers AMB Bio Media™ providing 850 m2/m3 of total media surface, and 500 m2/m3 is considered as active bio surface when implemented into WWTP's. 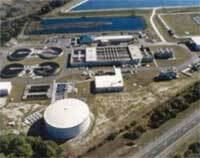 The AMB Bio Media has been extensively tested and implemented into numerous wastewater plants worldwide. The AMB Bio Media has proven to be superior to any known bio media, and can handle pH variation, shock loading, temperature variation, and drastically reduces plant size. The AMB Bio Media has proven to stabilize most wastewater plants and is used on a global scale to Retrofit and Customize new and old WWTP's with great success without tank expansion. General Ref List for Package Plants.